Memoirs of a Madcap Musicmaker Madly Musicmaking and Making Mad Music (Est. 2004): Nick Choo Music! Hey all! I've been spending the past few days working on a new website and, in the interest of getting it up and running fairly quickly, I used Blogger to create it. 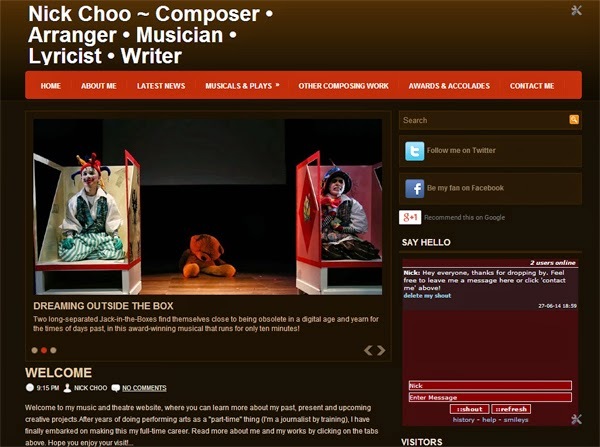 So here it is, the brand-new www.nickchoomusic.com, for your viewing and listening pleasure! It's got all my musical projects on it, and I'll be using it to promote current and upcoming material too. The end game, of course, is to transition it into a website proper, and I'll be developing that over time; and I'm likely to change the current layout and template over the next few days and weeks anyway. But in the meantime, do enjoy what's there, and check back in regularly (to that page and this one), y'hear? Till next time!